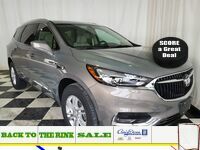 Families seeking a spacious three-row crossover SUV with the best in connectivity features will be delighted with the 2017 Buick Enclave in Portage La Prairie MB. This mid-size vehicle seats up to eight passengers (with leg room in the third row even for adult riders), and offers generous interior cargo options. There are 23 cubic feet of space available behind the rear seats for luggage. That space expands out to 115 cubic feet of space available when the seats are folded down, making the 2017 Enclave even more versatile. Outfitted with a confident 3.6-litre V6 engine with standard direct fuel injection, the 2017 Buick Enclave can deliver 288 horsepower and 270 pound-feet of torque. This engine is mated to a responsive six-speed automatic transmission for premium fuel efficiency. Front-wheel drive is standard but all-wheel drive is available to increase security and traction in any and all Manitoba weather conditions, and on roughtly paved back roads. This is a large and luxurious vehicle which handles curves and challenges with poise. Opting for the Sport Touring Edition of the 2017 Buick Enclave adds new and attractive exterior highlights to this excellent SUV. A unique Satin Black Ice-toned grille, and 20-inch chrome-clad wheels with Satin Black Ice accents will make this model stand apart, while also delivering comfort and performance advantages. From excellent private and governmental crash-testing scores to the available driver awareness features, the 2017 Buick Enclave delivers premium safety. Some available features that help drivers stay alert on the road include side blind zone alerts, rear cross traffic alerts, forward collision alerts, and lane departure warnings. Every 2017 Buick Enclave comes standard with the ability to become a 4G LTE Wi-Fi hotspot thanks to OnStar connectivity. This includes several months of complimentary data. This system can connect up to seven devices to the internet, and help streamline both navigation and entertainment. The basic advantages of the 2017 Buick Enclave in Portage La Prairie MB boil down to reliable performance, generous space, and top equipment. It is available in Convenience, Leather, and Premium Group trims. Standard features on this mid-size SUV include the Buick IntelliLink system with a 6.5-inch colour touchscreen and voice control responsiveness, a dual exhaust system, a rearview camera, remote start, a power liftgate, and Buick QuietTuning technology. Discerning drivers can choose to embrace so much more on their new Buick SUV. Some specialty features available on the 2017 Buick Enclave include a rear entertainment system, rear parking assistance, a power moonroof, driver memory settings, and heated and cooled front seats. To learn more about the features and advantages of the 2017 Buick Enclave near Portage La Prairie MB, contact Craig Dunn Motor City or fill out the form on this page. Interested in a 2017 Buick Enclave?